A panel of experts on Russia discuss real-life experience in the region, and share their perspectives. Speakers include Marshall Goldman, who recently met Russian President Vladimir Putin; Philip Kohl, who studies and travels regularly to the volatile Caucasus area; Nina Tumarkin, who just returned from Russian Karelia; and Ambassador Thomas Simons Jr., former US ambassador to Poland and Pakistan. Once again, the eyes of the world are on Russia, where recent acts of terrorism by Chechen rebels were followed by President Putin's proposal of new measures to further centralize power and limit democracy. Marshall I. Goldman is a professor emeritus in the Wellesley College Department of Economics. An expert on the Russian economy and the economics of high technology, he joined the Wellesley faculty in 1958. He is also Associate Director of the Davis Center for Russian Studies at Harvard University. 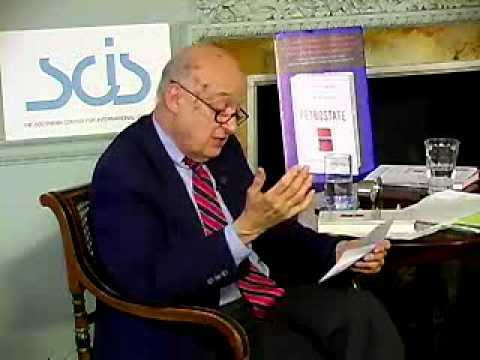 Professor Goldman is a 1952 graduate of the Wharton School of the University of Pennsylvania and received MA and PhD degrees in Russian studies and economics from Harvard University in 1956 and 1961, respectively. Professor Goldman has served as a trustee of the Noble and Greenough School as well as The Commonwealth School of Boston and is past president of the Hillel Council of Greater Boston. An internationally recognized authority on Russian economics, politics, and environmental policy, Professor Goldman is known for his study and analysis of the careers of Mikhail Gorbachev and Boris Yeltsin. He is the author of over a dozen books on the former Soviet Union, including The USSR in Crisis: The Failure of an Economic System, and Gorbachev's Challenge: Economic Reform in the Age of High Technology (1987). A consulting editor to the journal Current History, Goldman's expertise is also sought by the media. He has writen frequently for such publications as Current History, Foreign Affairs, The New York Times, The Washington Post, and The Harvard Business Review. He has written regularly for the Russian newspapers, Moscow News and The Moscow Times, and is often heard on National Public Radio. Nina Turmarkin is Professor of History at Wellesley College. She has also been a Fellow at the Harvard University Russian Research Center for a quarter-century. At Wellesley, where she has taught since 1975, Professor Tumarkin specializes in courses on the entire span of Russian history and on Europe in the 20th century. Her first book, Lenin Lives! The Lenin Cult in Soviet Russia (1983), won that press' Wilson Prize for best first-book manuscript, and was acclaimed by reviewers in New Republic, Newsweek and other publications. In the past 10 years Professor Tumarkin has published a variety of articles, including two in Atlantic (1990, 1991) and two "Talk of the Town" pieces in the New Yorker (1990). She has also appeared on local and national radio and television programs as a commentator on contemporary Russia. In the mid-1980s Professor Tumarkin served as a special advisor to the National Security Council and to President Ronald Reagan. In 1985, she was the only woman of six Sovietologists to brief President Reagan, Vice President Bush, Secretary of State Schultz and other members of the administration before Mr. Reagan's first summit meeting with Mikhail Gorbachev. Nina Tumarkin is currently working on an expanded edition of her first book, Lenin Lives!, to include the recent desacralization of Lenin.